in a letter to all state chief ministers, Union minister for environment and forests T R Baalu questioned the appointments to pollution control boards (pcb) that were made without following the stipulated requirements in the acts. He directed that appropriate persons be appointed for the key positions and incumbents, not possessing the required criteria be replaced. But the letter seems to have had no impact till now. Qualifying for the post of a pcb chairperson seems an easy task today. All it takes, to be eligible for the post of the chairperson is a little environmental know-how and a lot of political clout. As per the existing norm, Water (Prevention and Control of Pollution) Act, 1974 a person 'with special knowledge or practical experience in respect to matters relating to environmental protection' can be nominated by the state government for the post. The vague description of the eligibility criteria in the laws has led to various interpretations. Loopholes in the guidelines, has seen, from academics to local politicians taking over the post of pcb chairpersons (see table : Present scenario ). 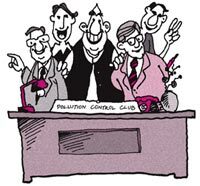 "Most chairpersons and member secretaries do not have technical knowledge about pollution control issues," says Michael Mazgaonkar of Gujarat-based non-governmental organisation Paryavaran Suraksha Samiti (pss). He further points out, "The chairperson of Gujarat Pollution Control Board is K V Bhanujan from the Indian Administrative Service (ias). Even the member secretary of the board is from the Indian Forest Service (ifs), and has little knowledge about pollution prevention." In 1998, a candidate for the post of member secretary of the Assam State Pollution Control Board (aspcb) was a cartographer, with a degree in geography. Some chairpersons, such as Mushtaq Antulay of Maharashtra Pollution Control Board and Rajeev Bindal of Himachal Pradesh Pollution Control Board, are local politicians. pcb officials admit that the recruitment policy is unclear. The ambiguity, they point out, exists due to the various connotations the appointment criteria has acquired over the years. In 1974, when the Water (Prevention and Control of Pollution) Act recommended the setting up of pcbs, the role of these boards was limited to water pollution. Later with the Air (Prevention and Control of Pollution) Act, 1981 and the Environment (Protection) Act, 1986 -- the mandate of these boards increased. "Though in the last 20 years, the role of the pcbs has widened, the governing body has remained the same," admits a senior Central Pollution Control Board (cpcb) official. Surprisingly, instead of revising the existing norms, a new trend of 'part-time' chairpersons is gaining ground. As per information received from the cpcb, out of a total of 32 pcbs in the country, almost 22 (which amounts to about 70 per cent) have 'part-time' chairpersons. These officials are on deputation and hold some other position in a state government office. Whereas technocrats claim that they should be ideally heading the pcbs, ias officers are of the view that they are faring better. "Look at the record of pcbs, headed by ias officers and one will know how well they are functioning," says Naini Jayaseelan, chairperson of Delhi Pollution Control Committee (dpcc), who herself is from the ias cadre. However, others disagree. " ias officers lack sound technical understanding about matters related to pollution," avers L N Bora, chairperson of aspcb and former professor at Assam Agriculture University. In some states legal bodies have had to intervene in pcb appointments. The Jharkhand High Court recently ordered the dismissal of Thakur Bal Mukund Shahdeo, chairperson of Jharkhand Pollution Control Board. The court observed that Shahdeo was unqualified for the post as he was only a matriculate, with no understanding of the environment (see: "News: Unfit for Office" Down To Earth, Vol 11, No 3, June 30, 2002). Although there have been some efforts to streamline the recruitment process of pcbs, all attempts have unfortunately remained on paper. While the Bhattacharya Committee report in 1984 recommended reduction of number of officials on deputation, the Belliappa Committee report in 1990 asked for revision of the recruitment policy to include persons with suitable qualifications. Till date, no action has been taken. And it is business as usual.